My pleasure. I was happy with the mix of weather, and by the time we saw Moraine Lake it was sunny & warm again. From my views of Morant's Curve, I noticed a disappearance of some of the mountain-snow between my Thursday visit and Saturday. The snow event in the Bow Valley was mainly a 1-day thing, the day before we arrived. A morning spent at Morant's Curve. - 3 trains seen by me, shown in this video. The 3rd train is the track-maintenance train that Wett Coast identified from my earlier posted photo. 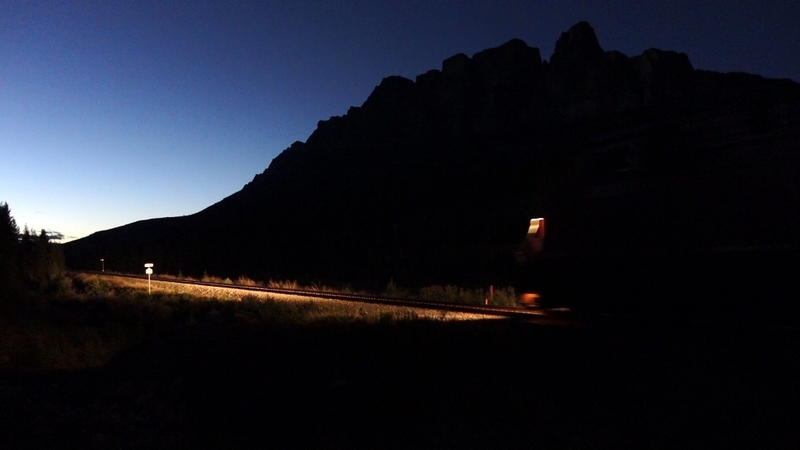 Some stills and a video compilation shot trackside at Castle Junction, AB. I stayed at a cabin resort next to this crossing. Lovely cabins, and the train sounds didn't bother us too much at night. The hulking mountain became a familiar and pleasant sight, day or dusk. CPR's upper spiral tunnel is now a better viewing experience than the lower tunnel; because of the trees. However, the upper spiral tunnel is by necessity a zoomed experience. One of my purposes in life is to visit this spot every few years, so that I can show tourists where to look on the distant mountainside. The viewpoint is on Yoho Valley Road, which is the road that eventually takes you to Takakkaw Falls. The road meets Hwy-1 at the base of the big hill, just east of Field. The train in my video is a long eastbound doublestack. It is slowly making its way up the grade towards Kicking Horse Pass. 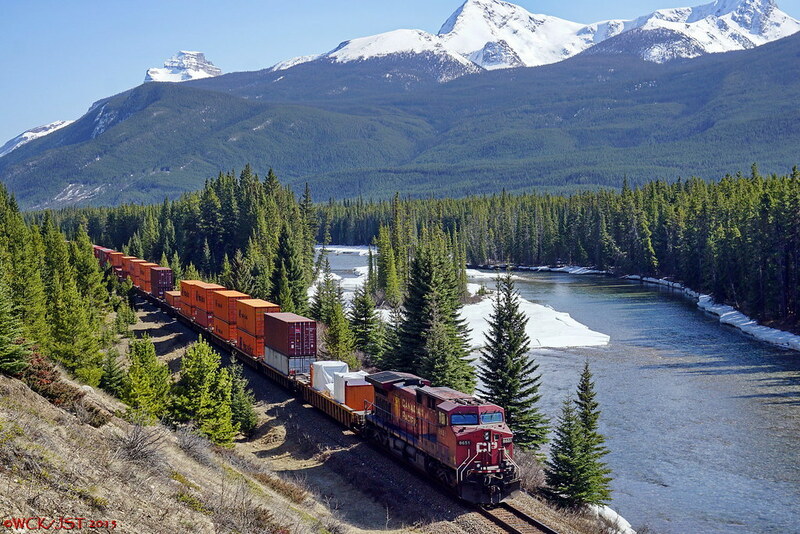 Another view of the CPR track along the Bow River, in Banff National Park. - I'm looking westward at the Storm Mountain Lookout. This is a good spot for train photography, but only for the westward view. - I'm on the cliff above the parking area. This location is one of my favourite places on Earth. 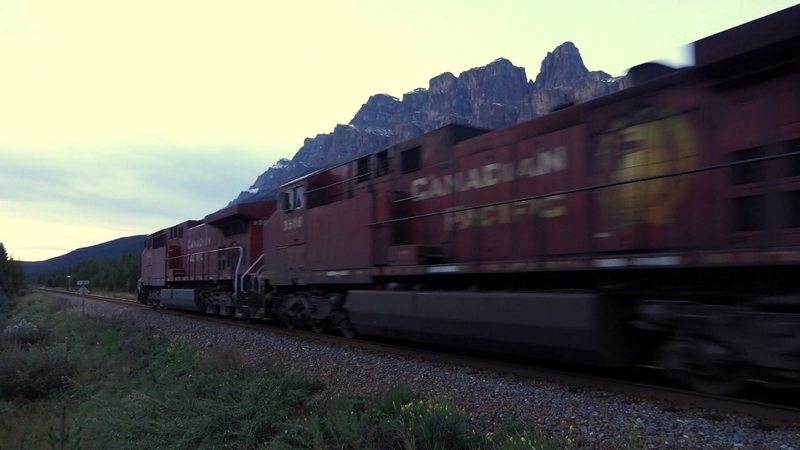 Here's a corporate video on the 1980s CP Rail Rogers Pass Project. An interesting thing to watch, especially if you know a bit about the Rogers Pass area and the current day tracks. I have watched a portion of this tonight & will watch the rest tomorrow. Is the narrator Nolton Nash, one time anchor of CBC's The National? I have to take issue with what they claim regarding the building of the Connaught Tunnel. They say it was built as part of a double tracking project, & not because of snow & avalanche issues. This flies in the face of everything I have ever read & heard on the subject and quite frankly the claim is nonsense. Nevertheless, during the early 20th century, Canadian Pacific was working on double tracking parts of their mainline and the Connaught Tunnel was built with two sets of tracks in it. 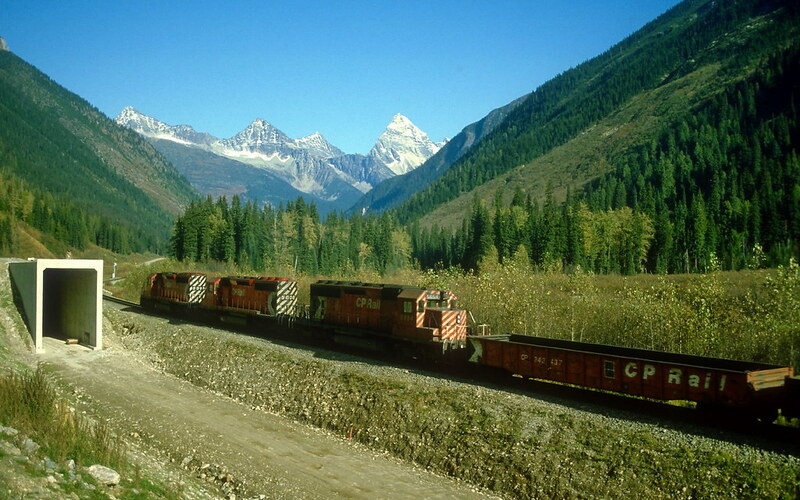 The same goes for the line west of Revelstoke where wide tunnels were built to handle double tracks. In the late 1950's these tunnels & tracks were converted to single tracks to allow for improved clearance for 'tall' rail cars starting to become common at that time (the tri-level auto carrier being an example). Today perhaps half the cars running on the trans continental rail lines are double stacked container flats and obviously need that improved clearance. The narrator looks very familiar, can't think of his name right now, however it isn't the late Nolton Nash. I think the narrator was an actor that did various Canadian TV commercials in the 1980s. 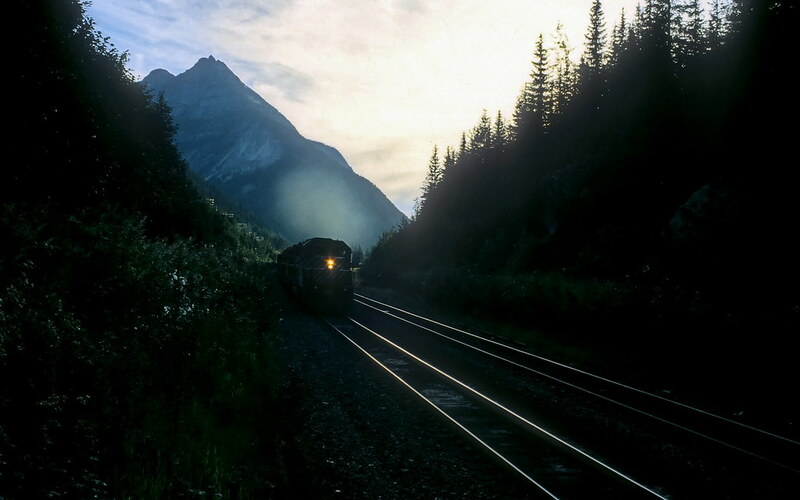 first CP employee to appear in this video is Mr. Omer Lavallee, author of the book "Van Horne's Road"
Here are a couple of my Canadian Pacific Mountain Sub photos taken east & west of Rogers Pass, before the opening of the Macdonald Tunnel in 1988. An east bound CP freight approaches the Selkirk summit at the west portal of the unfinished Mt Macdonald Tunnel just west of Glacier House, BC - 30 Sept 1983 [Ektachrome]. This train would continue to climb for another five kilometres to the west portal of the Connaught Tunnel where it would start its downhill run toward Donald & Golden. In this photo you see the concrete box that forms the east portal of the Macdonald Tunnel, and takes it under the Trans Canada Highway. Construction on the actual 14.5 km bore under Cheops Peak & Mount Macdonald did not begin until a year after this photo was taken. 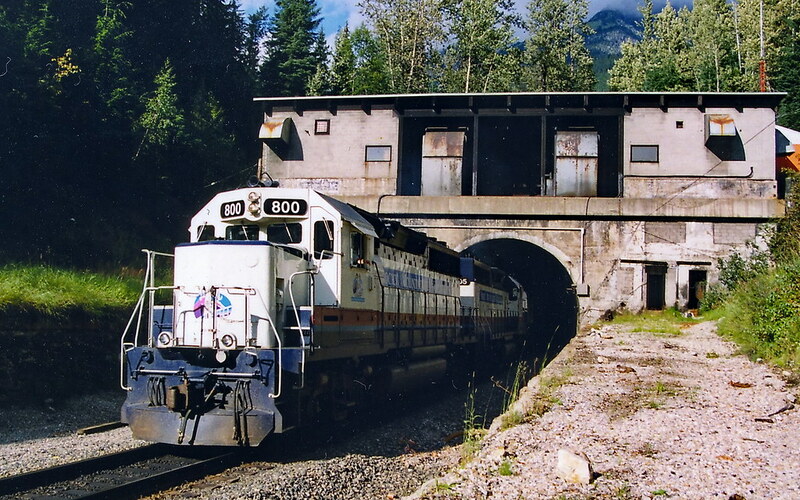 The Macdonald Tunnel is the longest railway tunnel in the Americas. Prior to the completion of this tunnel the longest was the Cascade Tunnel under Stevens Pass on Jim Hill's Great Northern Railway (now BNSF) east of Seattle. East bound CP freight with about 100 metres to go before entering the west portal of the Connaught Tunnel at Glacier, BC - 14 September 1981. 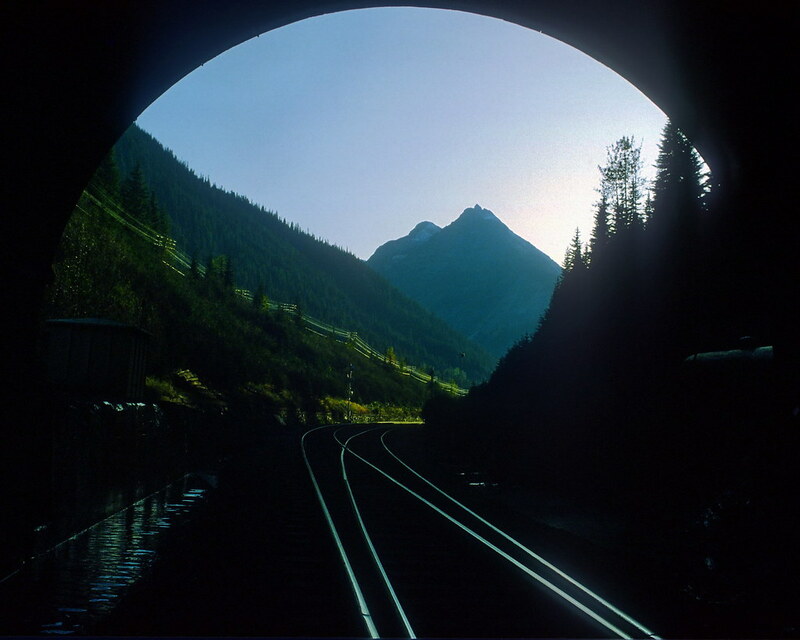 View looking out through the west portal of CP's Connaught Tunnel, just west of & below Rogers Pass, BC - 29 September 1983 [Ektachrome]. This tunnel is 8 km in length, originally double tracked, & was completed in 1916. Nick Morant took photos framed through tunnel portals. He was authorized to do so by his employer. I did this when I was younger and perhaps just a bit foolish. The stone arch bridge that carried the original (1885-1916) Canadian Pacific Railway grade over the Illecillewaet River just west of Rogers Pass - Glacier National Park, BC - 14 July 2002. This bridge was built in about 1895. It replace an original timber structure constructed ten years earlier. 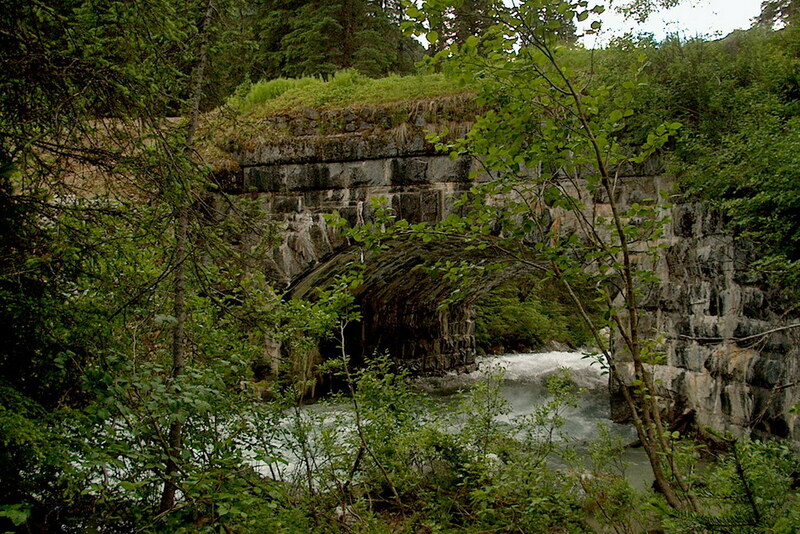 This bridge remained in use by the railway until late in 1916 when the nearby Connaught Tunnel under Rogers Pass was opened. The bridge supported both the main line and a passing track. Today there is a gravel road on the bridge deck which leads to the site of the CPR's one-time hotel that was known as Glacier House (torn down in 1929). Many good hiking & mountaineering 'approach' trails were developed in the area around Glacier House. One of those trails is a short walk called the 'Meeting of the Waters' trail which leads to good views of this bridge. 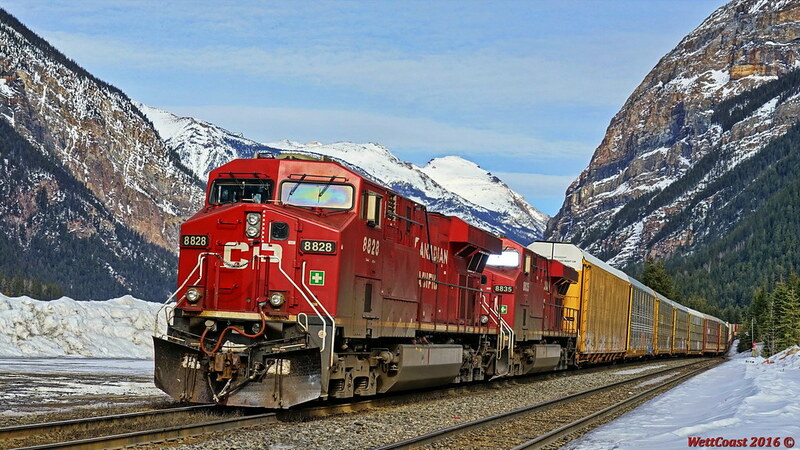 This a a must see spot for those interested in the railway history of Rogers Pass. CP west bound unit coal train thundering up grade over Stoney Creek Bridge - Mountain Subdivision just east of Rogers Pass - four of twelve 3000 HP locomotives visible - 15 September 1981. This was taken about 7 years before the new 'second main line' (aka Macdonald Track) went into operation allowing heavy west bound trains to go faster and with much less HP over the summit of the Selkirk Mountains. Today, this bridge is used predominantly by east bound trains going down the 2% grade toward the former pusher locomotive base at Rogers. The train seen here, with 100 cars of coal and a gross train weight of 15,000 tons, had four SD-40 3000 HP locomotives on the head end, three more remote controlled engines of the same type about half way back in the train, and finally, a manned 5 unit pusher set cut in about 15 cars ahead of the caboose. And finally a bonus, this one taken almost 10 years after the Macdonald Tunnel was opened. West bound Rocky Mountaineer emerging from west portal of 8 km long Connaught Tunnel, Canadian Pacific's Mountain Subdivision, on mainline between Calgary & Vancouver - early September 1997. Note that this train is west bound through the old tunnel which is normally only used by east bounds. Passenger trains apparently are always routed through the Connaught Tunnel. They don't want them fouling up the new tunnel. That 'stuff' located above the tunnel entrance is a battery of very large fans that push air through the tunnel to purge it of diesel exhaust. You have caught me again confusing east & west, even within the same paragraph. You have yet to do that with north & south, though. Or up & down? Yes, this place is the west portal of the Macdonald Tunnel. The actual bore through the mountains, however, begins a 100 metres or so east of the entrance to this box, which was built to take the tunnel approach under the TCH # 1 and safely through high avalanche terrain before going underground. Just came across this for coal trains. Sorry it was posted before. That's in the Notch Hill area, near Tappen, west of Salmon Arm. The location is beside a rural road, so it's easy to get to. That being said, I haven't got there yet. ....some day. The eastward view is not so bad after all. The photo below shows the tail end DPU on an east bound 'stack' train passing Storm Mountain Lookout in the Bow Valley, near Castle Junction, Banff National Park. through and and worked in. November 7, 1885 - Craigellachie, BC. 130 years ago today. That was an important time, in this fair land, when the railroads were starting to run (but not fully until the next spring). The wild, majestic mountains would no longer stand alone against the sun. the dead men . . . . too silent, to be real . . .
And of course not just those that built the railways, but the ones who laid down their lives that we remember on the 11th day of November . . .
a couple of scanned slides, the first one is mine, the second is from the camera of my brother John (Victoria British Columbia, on Facebook). CP East bound freight led by # 6011 & three other SD-40's, about to crest the continental divide - @ MP 124 of CP's Laggan Subdivision - 21 September 1983. This is barely in BC, just a little west of the continental divide at Kicking Horse Pass (Stephen, on CP's map). These locomotives are still straining to pull this train up 'the hill' from Field, though the worst of the climb has been done. Soon dynamic braking will be applied as this train starts down the other side of the hill from Stephen to Lake Louise station. 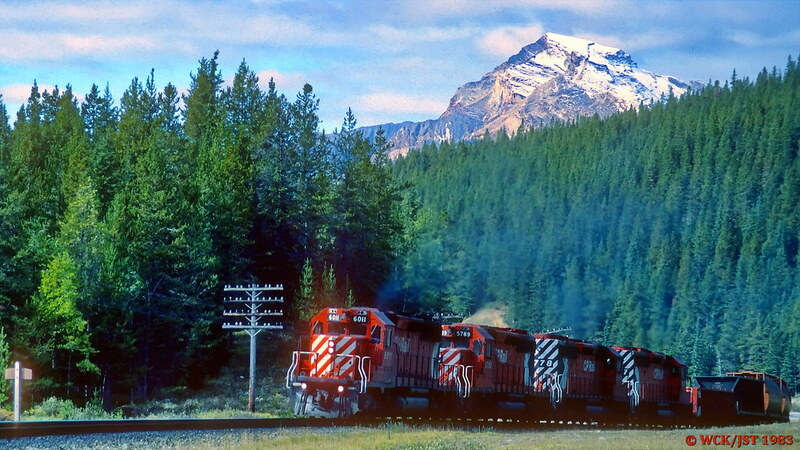 Back in the early 1980's the SD-40's ruled the line on CP's main routes through the mountains of BC & Alberta. Usually there were four of them on the head end as you see on this train. Heavy west bounds might have an additional three remote controlled 'helpers' half or 3/4's of the way back in the train. 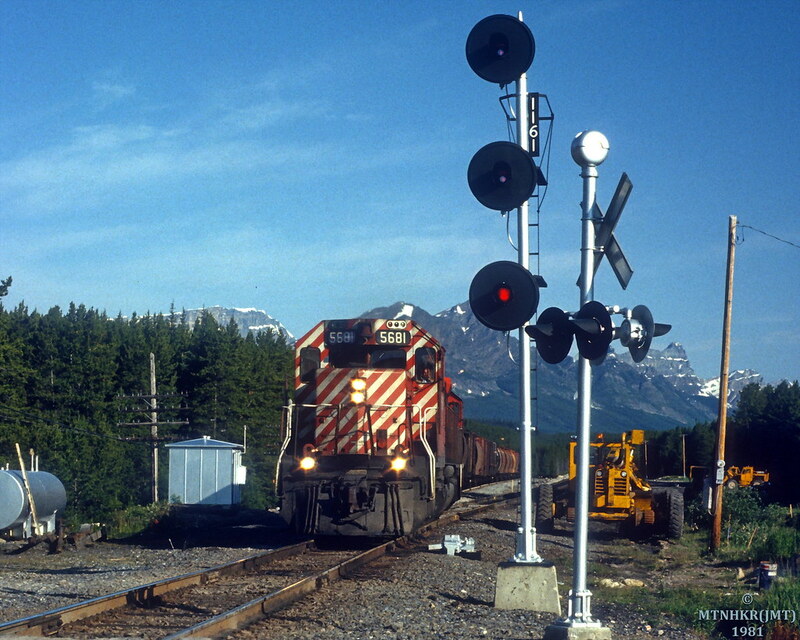 CP # 5681 leads east bound Canadian Pacific grain empties through the Lake Louise east switch, Laggan Subdivision, Alberta - summer 1981. That looks to be the then new Lake Louise 2nd mainline branching away on the right. This was constructed in the early 1980's on a steady 1% ascending grade from Lake Louise up to Kicking Horse Pass to the west. Once it opened to traffic, heavy west bound trains used the new line while east bound trains used the original 1880's more steeply graded route going down hill. Canadian Pacific east bound empty grain train departing Field, BC, on the Laggan Sub for the 'Big Hill' & the Spiral Tunnels - 19 March 2016. Note that this video contains 'a message' that is not endorsed by 'moi' & may upset a viewer or two! Thanks for the video. No how matter how impressive the GE locomotives are, I do miss the sound of the GM SD-40 when powered up like the units on this train. A road rather than a thunder I think!! The 'message' referred to aside, the amount of tagging might lead one to wonder where the CP police/security folks are when these grain cars are sitting idle?